Greater Mexico City spreads over the valley of Mexico, also known as the valley of Anáhuac. A system of interconnected lakes originally occupied a large area of the valley, and Mexico City was built on the island of Tenochtitlan, in the middle of Lake Texcoco, the largest of those lakes. In the early 1500s, during the Spanish Conquest of Mexico, the dikes that protected the city from recurrent floods were destroyed and colonial authorities drained the water from the lake, which was, for the most part, shallow. Mexico City was therefore built over unstable land, causing the continuous sinking of the city center. Since the arrival of the Spanish army and up until the present, the valley of Mexico has been both the seat of government and the center of Mexican finance. ​Air pollutants get trapped in the basin that is the valley of Mexico. ​Air pollution has long been one of the city’s most intractable challenges. The valley of Mexico is located in a basin surrounded by mountains on all four sides. With only one small gap at the north of those mountains exhaust emissions from the city are trapped within it. 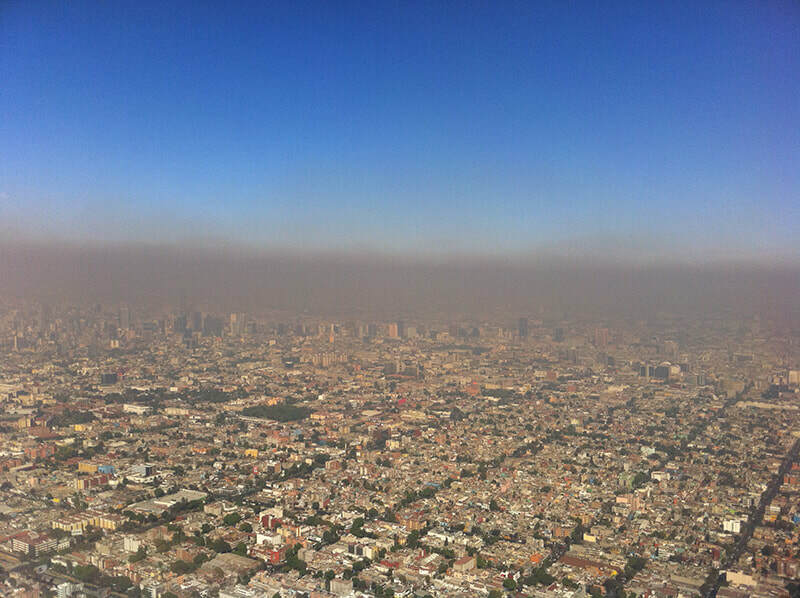 Additionally, the region experiences anti-cyclonic systems, producing weak winds that prevent the dispersion of the accumulated air pollutants produced by the 50,000 industries operating in Greater Mexico City and the 4 million vehicles circulating on its roads and highways. Even before the Conquest, the economic and social wealth of the region was concentrated in Greater Mexico City, and the engines of that economy have consumed or debased much of the natural resources of surrounding regions. Greater Mexico City is illustrative of both the positive and negative consequences of wealth centralization. It has become a city where inequality and the consequences of climate change are everywhere evident. Every rainy season, the city drowns due to its lack of capacity to handle such deluges, while the rest of the year it struggles to provide basic water access to its ever-growing population. 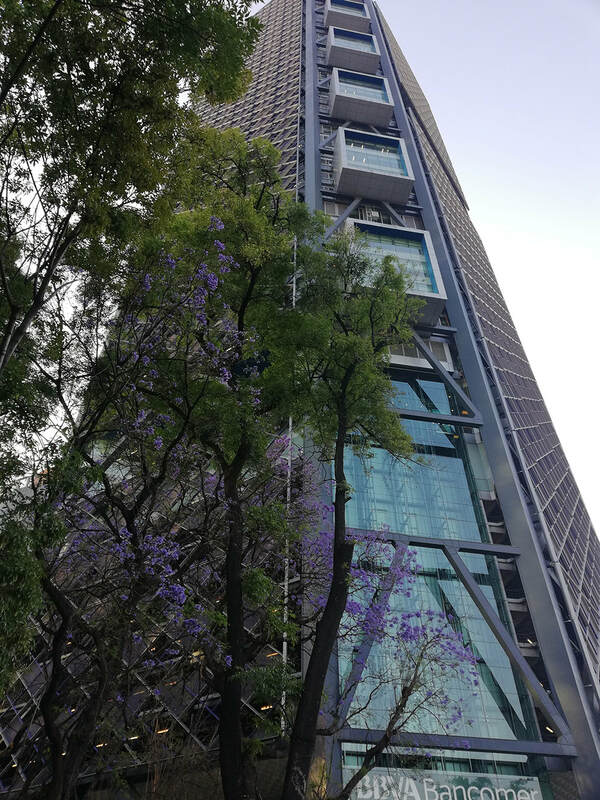 Torre Bancomer at Paseo de la Reforma. Photo credit: Cecilia Latapi. Nevertheless, the results of the concentration of wealth and financial resources in the valley of Mexico has also generated an incredible concentration of creative energy and the spaces necessary to explore new ideas. Mexico City is today a hub for the arts, attracting creatives from all over the world. The concentration of economic power in the city has also attracted certain motivated individuals from all over the country who have the willingness and capacity to deploy their financial wealth to address the most vexing problems created by the extractive economy, within and outside of Mexico City. The presence of so many local and international organizations incubating new ideas has catalyzed a sense of promise and possibility. Espacio cultural at San Jeronimo-Pedregal. Photo credit: Cecilia Latapi. ​During the last few years, a convergence of interested groups and individuals have been working together to develop projects that operate according to a new set of values in Meixco. Accelerators, incubators, and investors are starting to explore alternative investment mechanisms to generate financial structures that distribute wealth and that honor a sense of place. 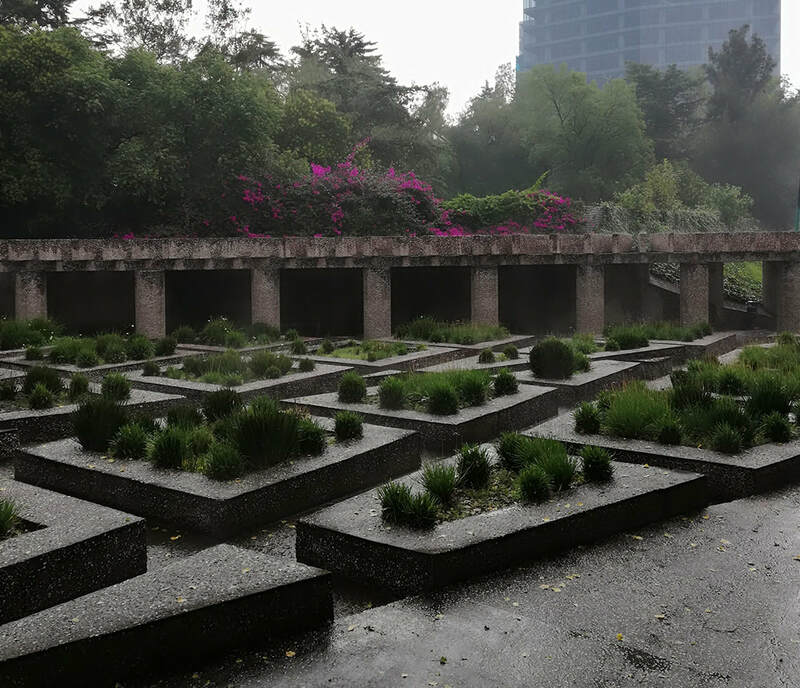 The Mexico City Hub is now working on a national scale to identify initiatives with the potential to regenerate natural, social, and economic capital. 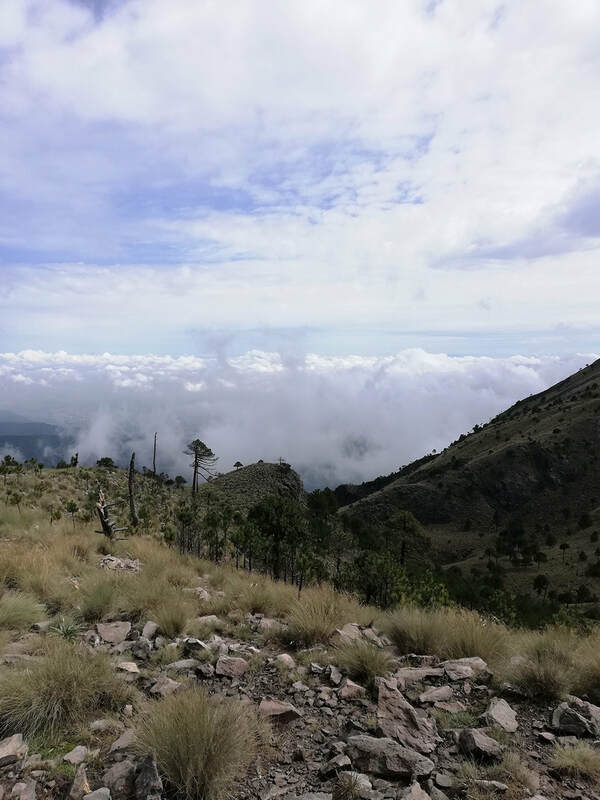 The Hub is performing several parallel activities: First, it's working on a systems mapping of the initiatives that are focused on biodiversity in Mexico. Second, it’s educating Mexican investors about alternative investment structures. And finally, it's developing specific investment structures tailored to finance projects that have the potential to restore natural, economic, and social capital on a national level. We intend to expand our efforts through our membership in the Regenerative Communities Network, connecting with like-minded individuals interested in financing this regeneration. The Ajusco Valley. Photo credit: Ceclia Latapi.